How to use conditional logic and then display custom meta on a page. Home / General / How to use conditional logic and then display custom meta on a page. Re-Envisioned › Support › General › How to use conditional logic and then display custom meta on a page. This topic contains 5 replies, has 2 voices, and was last updated by @mindspark 9 months, 3 weeks ago. I have created a CPT – ‘People’. Each person works in one of two offices – Tampa or St Pete. The office locations are Taxonomy assigned to CPT People. I am using MetaBox AIO and I am not a programmer. How / where do I provide the actual address for each of the 2 office locations? I need help writing the snippet that will display the office address based on which office each People is assigned to. Are “Tampa” and “St Pete” terms of the “office location” taxonomy? 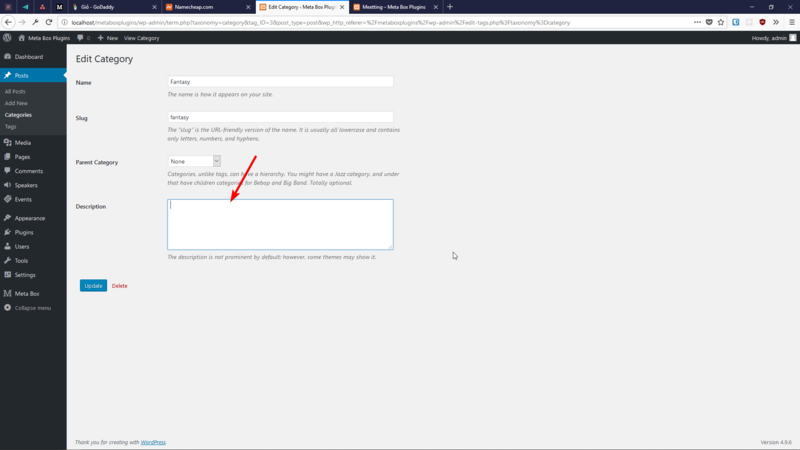 Use the default WordPress term’s description for actual address (https://i.imgur.com/GIU2Bbb.png). If you don’t use the description for any purpose, it’s good to use it for address, cause it doesn’t require any coding. Or you can use the MB Term Meta extension to add a text field “Address” for “office location” taxonomy. You can use the Meta Box Builder to create that field for you if you’re not familiar with coding. Just remember to go to Settings tab and select “Terms” & “Taxonomy” for the setting “Show meta box” for. After that, you’ll be able to enter address for each location (“term”) when you edit them. echo 'Address: ', $location->description; // If you use term description. Yes Tampa and St Pete are taxonomies assigned to CPT People. thanks for help with the script…. Direct Line: [custom meta field PHONE NUMBER]. So am I able to add the snippet you helped with into a text box or HTML module? or do I need something more advanced to run PHP inside a page or widget? My People CPT are attorneys. there are about 18 meta fields in use to collect info on each Person that will be used to display when users visit the Profile page. also, each of the People CPT are authors for various blog articles, so we are using the Co-Authors plugin to handle that. this is important to mention because in addition to the profile info displayed for each attorney, we also need to display all articles attributed to them. Because the Tampa and St. Pete are terms that are connected to People CPT, to get the address, we actually go from post (People) -> taxonomy term (Tampa/St. Pete) -> term field. So I think the Beaver addon doesn’t work. It can only get post field for the current post. I’d suggest you write a custom shortcode to get the term address. Then you can put it in the Text/Heading field in the Beaver Themer. Adding prefix text is also easy then. Thanks Anh. I’ll let you know how it turns out.